The TMS FridgiTherm is a digital thermometer designed for monitoring the temperature of incubators, vaccine fridges and freezers that are used in pharmacies, hospitals and medical labs to help comply with regulations. The thermometer consists of the main with display, that mounts on the outside of the unit and the temperature sensor probe on a thin lead that goes inside the unit (normally around the edge of the door). The probe fits into to a mounting bracket that can be attached to a shelf, and is designed to give a representative measurement of the vaccines' temperature, without being disturbed by normal use (e.g. open and closing the door). It features a min/max function the stores the lowest and highest temperatures measured over a period of time and this can be reset after its they been logged (this is normally done daily). An alarm function can be configured to sound an audible alarm if the temperature has gone outside your set limits. 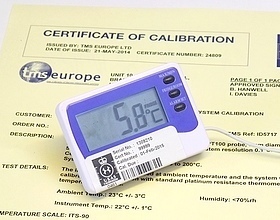 As TMS Europe is an UKAS (ISO 17025) accredited calibration laboratory we offer each unit complete with calibration at 4 points of temperature included in the price, giving certified accuracy. Each unit's calibration certificate is a legal certificate of metrology and is traceable to national and international standards. An instruction sheet, an ISO 17025 calibration certificate and a recording sheet (for daily logging of values) is included with each unit.